Situated in the plains of the Camdeboo just north of the Klein Winterhoek mountains lie the small Karoo towns of Jansenville and Klipplaat. Together with the hamlet of Waterford, these combine to form the Ikwezi Municipal Area. Jansenville lies in the heart of the Noorsveld with its distinctive spiky plants while Klipplaat lies in an area of typical Karoo vegetation. 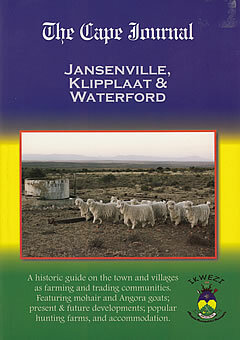 Angora goats thrive in these conditions and Jansenville has for long been the heart of South Africa's mohair production. In the heyday of railways in South Africa, Klipplaat was an important railway junction being the point at which the main Cape Town to Port Elizabeth line branched off towards Graaff-Reinet. Sadly those days have passed and Klipplaat has become a quiet little place with the station in a derelict state. The Jansenville area offers visitors a typical Karoo experience - clear skies with the brightest stars at night, clean air, wide open spaces, a rich history, comfortable guest houses, succulent Karoo cuisine, prehistoric fossils, guest farm activities, hunting opportunities for local and foreign hunters. Jansenville also offers several small town events worth attending. Bowls are played and visitors are always welcome. Please follow the links to read more about this fascinating area.